Stephen F. "Steve" Diser, age 76, of Alliance, passed away at 2:50 a.m., Monday, October 8, 2018, at Community Care Center. He was born May 4, 1942, in Cleveland, Ohio, to Frank and Evelyn (Stephenson) Diser. Steve earned his Bachelor's Degree from Kent State University and his Master's Degree in Industrial Safety at Central Missouri State University. 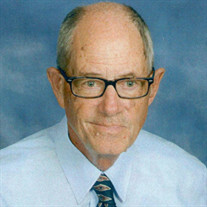 He was employed as a teacher with Stark County Board of Education and taught Drivers Education throughout Stark County. He later was an Industrial Safety Inspector, including carnival and amusement rides. Steve was a 64 year member of Christ United Methodist Church. He was active in the AHS Booster Club and belonged to the Classic Car Club on the national level. Survivors include his brother, Richard (Susan) Diser of Alliance; niece, Jennifer (Seth) Sutton of Alliance; great-nephew, Jacob; and great-nieces, Jordan, Jada and Jocelyn Sutton. Memorial contributions may be made to Christ United Methodist Church 470 E. Broadway St. Alliance, OH 44601 or to the AHS Foundation, PO Box 3123, Alliance, OH 44601-7123.